Because they come from all over the world to visit Pearl Harbor, I am treated to such responses from an almost universal audience from dozens of countries and all 50 states. It makes me proud to have created a new visual approach to this sacred American shrine – one contained in my picture book called, Renewal at The Place of Black Tear; one I call my up close look at the “black tears”. Teachers begin talking right away about using the book to teach lessons for their students. From every region of the county, they’ve become animated as they talk about combining art and history lessons for their young learners. Another surprise has been the healing power of some of the images in the book. I’ll talk about that in a later post. The summertime has been a time of families at Pearl Harbor – some with three generations visiting the memorial and talking together with me. There is a lot of sharing of personal stories – many concerning husbands, uncles, fathers, and grandfathers, sometimes about themselves or a brother – when, where and how they served. They range from the serious to the humorous. Everyone has a story. Often telling my dad’s story opens the door for others to tell their family’s story. There is lots of what in Hawaii is called “chicken skin” in those stories. The kids look forward to sharing with their schoolmates what they’ve learned at Pearl Harbor. I tell the kids that lots of “old people” – people in their 30s, 40s and 50s – tell me that they remember the day they first visited Pearl Harbor with their families.. I love to come early and stay late for book signing at the Pearl Harbor Visitor Center so I can meet and talk with people. I’ve quickly become an unofficial ambassador for the memorial. My only regret is that I don’t live in Hawaii; I only wish I could be here more often. Be aware that the education department of Pacific Historic Parks at Pearl Harbor is developing a 5th grade curriculum to complement the high school one already in use. They have worldwide video conferencing capability with the mission of telling the Pearl Harbor story. Imagine having Pearl Harbor historians, survivors and others interacting with students in your classroom. 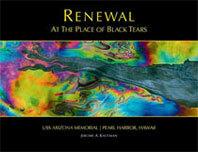 Many teachers (and librarians) have said they would like to connect and collaborate with other teachers around the country using Renewal at The Place of Black Tears as a catalyst for teaching the Pearl Harbor story. Combining art and history is a theme I heard several express.